Ever wonder what GBH 2-23 RE or GSB 21-2 RCT stands for? Did you know that Bosch product codes each have their meaning and interpretation? Knowing them will aid you in your Bosch product selection process catered to your specific needs! All Bosch power tools have their own unique model code devised by an alphanumerical system, understanding them can save you lots of time and money in getting the right tool that will deliver and do the job. Let us now learn more about the names and models; the focus is on professional tools. The alphabet above 1 categorizes the tool according to the functional area. G represents that this product is a professional tool meant for industrial tradesmen and end consumer use. 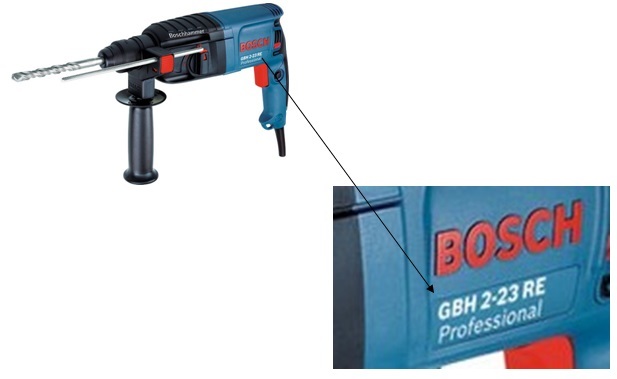 All professional Bosch power tools are predominantly dark blue in colour. P: DIY tools for DIYers, dark green in colour; and A: Outdoor tools or Garden tools, light green in colour. DIY tools are more commonly used in the Europe and US markets where the materials dealt with are generally softer in nature. The alphabets above 2 always consist of 2 letters. It defines the type of tools. BH represents that this product is a Rotary Hammer. The numbers above 3 represents the crucial technical data partly abbreviated. Different products have different crucial technical data, more commonly used ones are, weight of hammer (for rotary hammers), maximum concrete drilling (for most drills), power input in Watts, W; and battery voltage in Volts, V and Amperes, A. As this is a rotary hammer, 2 represent a 2KG hammer. 23 represent 23mm maximum concrete drilling diameter. Note that the maximum drilling diameter differs between materials such as concrete, wood and steel. Last but not least, the letters above 4 designate specific characteristics, special feature and function of the tool. The letters are meant to be interpreted separately. R represents the function of Reverse Rotation. Reverse rotation meant that the tool is capable of rotating in a reverse direction ideal for screw driving.